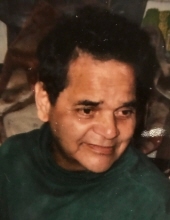 Joseph Jimenez, age 79, of Park Forest. loving brother of Maria ( Ramiro) Vasquez, Vincent (Esther) Jimenez and the late Helen Rios, John Jimenez, Richard Jimenez, Raul Jimenez and Gilbert Jimenez. Visitation Tuesday 3-8 p.m. at Linhart Funeral Home, 6820 W. Cermak Rd., Berwyn. Funeral services Tuesday 7:00 p.m. Cremation Private. To send flowers or a remembrance gift to the family of Joseph Jimenez, please visit our Tribute Store. "Email Address" would like to share the life celebration of Joseph Jimenez. Click on the "link" to go to share a favorite memory or leave a condolence message for the family.